Mabel Smith Jones, 93 years old of Elizabethtown passed away on Thursday, November 15, 2018 at Lower Cape Fear Hospice in Whiteville. A graveside service will be held on Monday, November 19, 2018 at 11:00 am at Dyson Cemetery in Elizabethtown with Rev. Walter Hayes officiating. Mabel Smith Jones was born May 9, 1925, the youngest child of Adolphus Herrington and Addie Dyson Smith. She was predeceased by six siblings: Mary Lee Wright, Eva Kathleen Johnson, Cora Elizabeth Mote, Janie Muriel DeVane, Matilda Herrington Mote and James Icom Smith. She attended the Elizabethtown schools graduating in May 1943. She went to Fayetteville in September of 1943, attending Worth Business College in 1944. She was employed in 1944 at Post Engineers of Fort Bragg until 1947 as a bookkeeper. She married Donald E. Jones known as "Pete" February 9, 1947. He was a Fayetteville Native employed as an electrician. They resided in Fayetteville until February 1976, moving to White Lake and remained there. 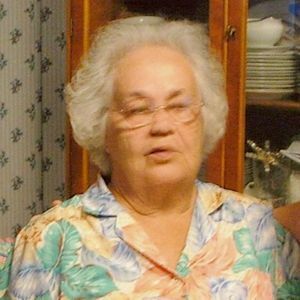 While in Fayetteville she was employed by Quinn and Miller Furniture Co. for 18 ½ years and Jones Electric for 16 years. She retired from her bookkeeping in 1984. While here at the lake, Mabel and Pete started the blueberry business known as "Flat Broke Flats" and worked until retiring in 1994. Mabel was known for stating "My life was a wonderful one." Cassidy Wright, Jackson Wright, Dalson Wright, Katie Wright, Charles Barnes, Ray Barnes, Mitchell Barnes and Lisa Long. Add your thoughts, prayers or a condolence to Mabel's guestbook.